Bella's Cottage01263 715779work01603 870304fax Self-cateringThis pretty and characterful cottage is tucked away in a row of similar cottages, set back from the coast road in the popular north Norfolk village of Stiffkey, which has a pub and a lovely village store, which offers more than the usual fayre. On the ground floor there is a sitting/dining room with woodburner and comfortable seating, which leads on to the well equipped kitchen. From the kitchen the winder staircase goes up to the first floor where there are two delightful bedrooms, one double, one twin and a shower room. The enclosed garden sits to the front of the property, with its box hedging, attractive planting and climbers around the cottage door. Stiffkey is within easy reach of the coast and there are many other villages to explore here each with their own character. There are beautiful sandy beaches at Wells-next-the-Sea, Brancaster and Holkham; whilst at Holkham, don't forget to visit its Palladian Mansion and deer park. Also close by is the delightful Georgian town of Holt, with art galleries, individual shops, restaurants, cafes, bars and antiques shops. Bella's Cottage offers weekly bookings starting on Friday. 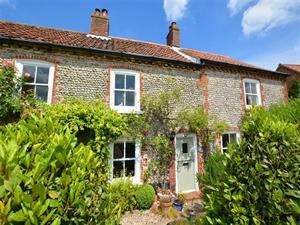 This pretty and characterful cottage is tucked away in a row of similar cottages, set back from the coast road in the popular north Norfolk village of Stiffkey, which has a pub and a lovely village store, which offers more than the usual fayre. On the ground floor there is a sitting/dining room with woodburner and comfortable seating, which leads on to the well equipped kitchen. From the kitchen the winder staircase goes up to the first floor where there are two delightful bedrooms, one double, one twin and a shower room. The enclosed garden sits to the front of the property, with its box hedging, attractive planting and climbers around the cottage door. Stiffkey is within easy reach of the coast and there are many other villages to explore here each with their own character. There are beautiful sandy beaches at Wells-next-the-Sea, Brancaster and Holkham; whilst at Holkham, don't forget to visit its Palladian Mansion and deer park. Also close by is the delightful Georgian town of Holt, with art galleries, individual shops, restaurants, cafes, bars and antiques shops.